SysAid > Company > Newsletter > Issue 38: Screenshots: Release of SysAid 7.0 Beta Coming Soon! It's hard to believe that on April 21, we'll be celebrating SysAid's seventh birthday! They say that 7 is a lucky number, if that's the case, then this anniversary marks a particularly successful SysAid season! First up: the Beta release of SysAid 7.0 is scheduled for May 3, 2010! This landmark release includes over 100 new features, a new SLA/SLM module, and many new additions that were developed in direct response to your suggestions and feedback. To get a taste of SysAid 7.0 before its Beta release, check out a screenshot sneak peek of some of its new functionalities. While we can't reveal too much now, here's some of what you can look forward to: a new SysAid Calendar, improved speed and usability, and an entirely new edition of SysAid for all of your enterprise needs! Want to be one of the first to see SysAid 7.0? Become a SysAid Pathfinder to take the Beta version of SysAid 7.0 for a test drive before its official release. This is your opportunity to influence SysAid 7.0 and give us the feedback that helps us make SysAid even better with every new release! The absolute first to see SysAid 7.0 will be all those SysAiders attending the SysAid Technology Conference at the end of this month! Here's the great news: we've extended the registration deadline until Monday, April 12, so that means you still have almost a week to get all your paperwork in! Sign up now and see lucky number 7.0 with us in Vegas! Last but not least, this April gives us fascinating insights into new IT Benchmark results! Read about them below to see how the IT Benchmark module has already helped IT departments improve their performance and establish better helpdesk processes. The numbers are there to prove it! I wish you a fruitful month and hope that your spring season is full of luck and success! IT Benchmark Analysis: Incredible Improvements Across the Board! Poll: How Much Do You Work from Home? An entirely new SysAid module to help you measure the quality of support you provide! An SLA (Service Level Agreement) is a contract between you and your end-users with criteria that you're later obligated to follow in order to provide the best possible service. Following an organized set of procedures with SysAid SLA will help you meet your deadlines and ultimately improve end-user satisfaction. SLM (Service Level Management) is the process of gathering different SLAs to analyze the overall success of your service delivery. 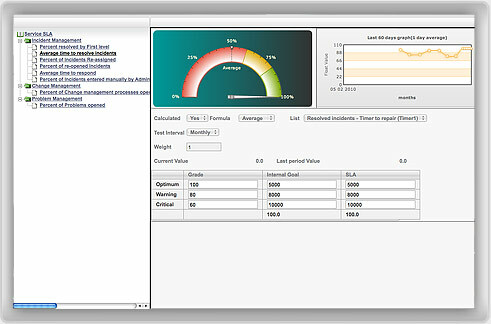 SysAid SLM includes a dashboard to help you measure your key performance indicators. See where you've succeeded, find where you need to improve, and develop goals for the future. SysAid's new SLA/SLM module combines SysAid's trademark simplicity with IT best practices to help you implement more effective procedures and provide better support! The SysAid Calendar is an entirely new SysAid module that's here to help make your life just a little bit easier! Providing you with a clear visual snapshot of what's lined up for the coming days, weeks, and months, the SysAid Calendar is much more than your ordinary day-planner. Why? It's completely integrated with the rest of SysAid! 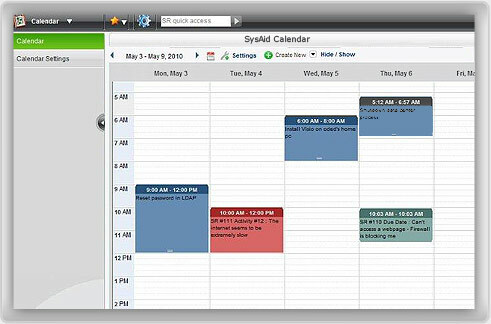 All of the Activities, Due dates, and Software support expiration dates you enter in SysAid are automatically logged in your SysAid Calendar! 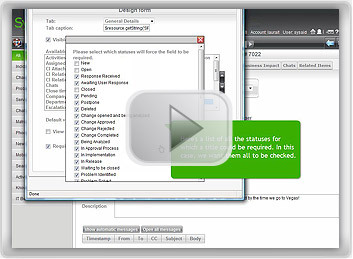 You can also easily create additional events with the intuitive, easy-to-use application. That means you have centralized access to a clear overview of what's in your IT department's pipeline. Even better, you can keep these events automatically synchronized with your Microsoft Exchange account so you can stay up-to-date even when you're not connected to SysAid! What Else Will SysAid 7.0 Hold? Improved Speed and Usability: Simpler and faster than ever before, we've added many tweaks to the system to make it as user-friendly as possible! End-User Portal in More Than 44 Languages: SysAid is more global than ever! Mandarin, Japanese, Hindi ... chances are if your end-users speak it, the End-User Portal can accommodate it! New Enterprise Edition: Our goal has always been to cater to the needs of all organizations, large or small. For SysAid 7.0, we've developed an edition to meet the unique enterprise-sized needs of your IT department! More than 100 other new features! Register now for the SysAid Pathfinder Program - it's your chance to take SysAid 7.0 for a test drive before the rest! If you can't wait until the official Beta release, join us in Las Vegas at the SysAid Technology Conference at the end of this month for SysAid 7.0's official unveiling! Registration ends in less than one week, so sign up now! It seems like the whole world's on Facebook these days, and SysAid's very own animated hero has now joined the virtual ranks of your friends, your coworkers, and who knows, maybe even your Mom! 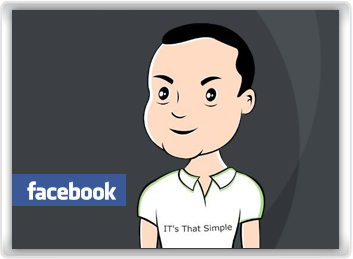 With a growing fan base of IT pros and admirers, Joe the IT Guy's Facebook Page is the place for you to stay up-to-date on the latest SysAid news, get the scoop on what's going on in the world of IT, and network with other pros in the industry. Become a fan to get inside tips that will help you stay-in-the-know and succeed on the job! What do YOU like most about SysAid? In the future there will be promotions for free SysAid merchandise, so become a fan of Joe the IT Guy and keep an eye on your Newsfeed! The Deadline Has Been Extended for 1 More Week! Great news - we've extended the registration deadline for the SysAid Technology Conference until April 12, 2010! We've received emails from people who need more time to finalize their POs and figure out other administrative logistics, so we decided to push back the deadline so you all can get your paperwork in. That means you have one more week to register for the SysAid Technology Conference! These 3 days are your exclusive opportunity to learn methodologies that will only be covered at the Conference and won't be available anywhere else! (As they say, "What happens in Vegas stays in Vegas...!") Better helpdesk strategies ... API secrets revealed ... SNMP and beyond ... customization to make SysAid work for you ... The SysAid Technology Conference is your greatest chance in 2010 to gain the skills you need to get the most out of SysAid and achieve true success in the world of IT! This April, Las Vegas is everything IT - sign up now and we'll see you there! Incredible Improvements Across the Board! Fantastic insights into the increasing success of IT departments using SysAid - all thanks to the IT Benchmark! In November 2009, we released the first worldwide averages for 7 of its different measurements. What did we find? Among the SysAiders surveyed, on average, 38% of service requests were opened via the End-User Portal and 32% via email integration. There has been a 42% increase (from 38% to 54%) in the number of service requests submitted via the End-User Portal and a 37% increase (from 32% to 44%) in the number of service requests submitted via email integration! Across the board, the overall percentage of service requests submitted via automated processes has dramatically increased. So why this incredible jump? One factor may be that after having viewed their initial IT Benchmark results, SysAiders became motivated to improve their own standing. Perhaps it was by kicking off their own SysAid Internal Campaign, or perhaps it was by simply encouraging the colleague who grabs their arm in the hallway to submit a service request. Even the smallest of efforts can make a big difference, and the benefits are clear! As the SysAiders surveyed already know, high values in both of these measurements mean higher-quality data, increased productivity, and more satisfied end-users. Congratulations to all of you who improved over the past few months! We truly look forward to seeing how else the IT Benchmark can help improve your IT performance! In your helpdesk list, do you ever find closed service requests that don't include enough details? Do you want a better record of what happened, why it happened, and what steps were taken to correct it? One of the most important aspects of maintaining an organized helpdesk is keeping a complete service history to refer to at any later time. With SysAid, it's easy to add required fields to your service request form so that an admin can't change its status without first entering the necessary information. Watch the tutorial below to see how to do it! Watch the other videos in our SysAid tutorial series to learn how to get the most out of other important features and functionalities! How Much Do You Work from Home? How much do you work from home? Answer our poll and add your two cents!